Wigan Athletic’s home game against Leeds United this Sunday should formally mark the handing over of control from the Whelan family to new owners International Entertainment Corporation (IEC). It’s just over a year since news first broke of the Whelan family’s intention to sell their controlling stake in the club, with IEC quickly establishing themselves in pole position, and the finishing line has finally arrived. The Hong Kong-based company is due to hold an extraordinary general meeting overnight – at 11:30am local time (3.30am our time) – ‘to consider and, if thought fit, pass’ the motion. And after last month’s announcement to the Hong Kong Stock Exchange that the company was recommending the purchase to its shareholders, their approval is seen as little more than a formality. The outcome of the vote will see the transition of ownership edge closer, which would then see more light shed on Latics chairman David Sharpe’s future at the club. According to documentation in the public domain, the sale of the club is worth just over £22million. The deal also includes the DW Stadium, the Training Centre at Euxton, the club’s Academy home at Christopher Park and the site of the old ‘Sharpy’s’ restaurant next to the stadium. IEC have already signalled their intention to appoint former Everton and Manchester City manager Joe Royle and his son Darren to ‘pursue designated objectives for the future of the club’ along with existing chief executive Jonathan Jackson. 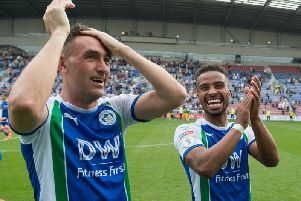 One of the first jobs for the new owners will be contract extensions for several key players – including Nick Powell and Sam Morsy – who are in the last year of their deals. Barring any complications, the new owners are expected to be in attendance on Sunday along with the Sky cameras.